1. Short for Internet Protocol, IP is an address of a computer or other network device on a network using IP or TCP/IP. For example, the number “166.70.10.23” is an example of such an address. These addresses are similar to an addresses used on a house and is what allows data to reach the appropriate destination on a network and the Internet. There are five classes of available IP ranges: Class A, Class B, Class C, Class D and Class E, while only A, B, and C are commonly used. Each class allows for a range of valid IP addresses. Below is a listing of these addresses. Class A 1.0.0.1 to 126.255.255.254 Supports 16 million hosts on each of 127 networks. Class B 128.1.0.1 to 191.255.255.254 Supports 65,000 hosts on each of 16,000 networks. Class C 192.0.1.1 to 223.255.254.254 Supports 254 hosts on each of 2 million networks. Class D 224.0.0.0 to 239.255.255.255 Reserved for multicast groups. Class E 240.0.0.0 to 254.255.255.254 Reserved for future use, or Research and Development Purposes. Ranges 127.x.x.x are reserved for the loopback or localhost, for example, 127.0.0.1 is the common loopback address. Range 255.255.255.255 broadcasts to all hosts on the local network. Every IP address is broke down into four sets of octets that break down into binary to represent the actual IP address. The below table is an example of the IP 255.255.255.255. If you are new to binary, we highly recommend reading our binary and hexadecimal conversions section to get a better understanding of what we’re doing in the below charts. If we were to break down the IP “166.70.10.23”, you would get the below value. In the below table, the first row is the IP address, the second row is the binary values, and the third row shows how the binary value equals the section of the IP address. There are several IP addresses that are automatically assigned when you setup a home network. These default addresses are what allow your computer and other network devices to communicate and broadcast information over your network. Below is the most commonly assigned network addresses in a home network. 192.168.1.0 0 is the automatically assigned network address. 192.168.1.1 1 is the commonly used address used as the gateway. 192.168.1.2 2 is also a commonly used address used for a gateway. 192.168.1.3 – 254 Addresses beyond 3 are assigned to computers and devices on the network. 192.168.1.255 255 is automatically assigned on most networks as the broadcast address. If you have ever connected to your home network, you should be familiar with the gateway address or 192.168.1.1, which is the address you use to connect to your home network router and change its settings. By default the router you use will assign each of your computers their own IP address, often using NAT to forward the data coming from those computers to outside networks such as the Internet. If you need to register an IP address that can be seen on the Internet, you must register through InterNIC or use a web host that can assign you addresses. Anyone who connects to the Internet is assigned an IP address by their Internet Service Provider (ISP) who has registered a range of IP addresses. For example, lets assume your ISP is given 100 addresses, 109.145.93.150-250. This means the ISP owns addresses 109.145.93.150 to 109.145.93.250 and is able to assign any address in that range to its customers. So, all these addresses belong to your ISP address until they are assigned to a customers computer. 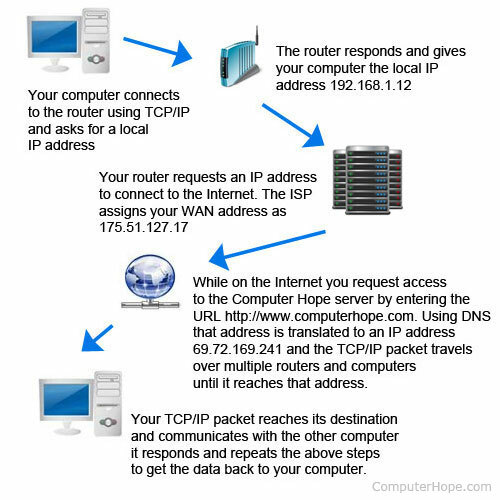 In the case of a dial-up connection, you are given a new IP address each time you dial into your ISP. With most broadband Internet service providers because you are always connected to the Internet your address rarely changes and will remain the same until the service provider requires it to be changed.